Ryukyu Life: Want to Drive a Sushi Chef Crazy ? That's right. There are 242 kinds of fish in the waters of Okinawa, Japan. This wall chart has pictures and the names of the fish in Japanese, English and Okinawan. The posters are sold at many touristy locations, throughout the Ryukyu Islands. I've seen them go for anywhere from 1,000 to over 3,000 Yen. That's like ten to thirty bucks. Get one HERE at a bargain. Tell the pretty gals, "A guy with a beard sent me." The chart is really huge and comes all rolled up, wrapped in cellophane. I tacked it to the wall and, to give you a better view, I chopped up and enlarged the photos. 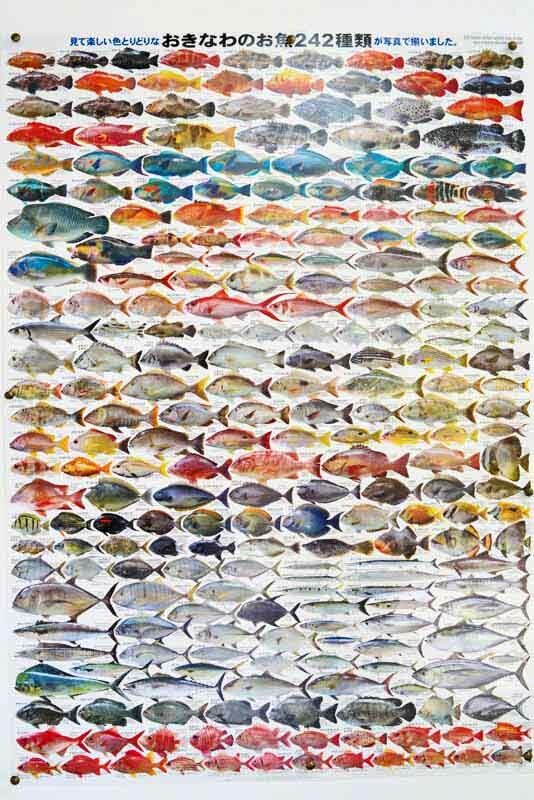 That's way too many fish, to be hanging on my wall. Soon, I'll take it down. For poor folks, who can't afford to buy the chart, go to Asia Pacific Fish I.D. They have images of all the fish and, English as well as, Japanese. There's even a guy in Tokyo, who gives you the same info for kosher and non-kosher dining. Saving the links above on your smartphone, might help you at the sushi bar. Get an old deck of cards and, with this poster, you could have lots more fun. Cut the thing up, into small pieces, paste and laminate them to the cards and, you're all set. Instead of pointing to the fish, inside some glass case, do what I'm gonna do. Buy the chef something to drink. They usually, go for sake or beer. Shuffle the deck of fish cards, pull one out and say, "Got any of this ?"